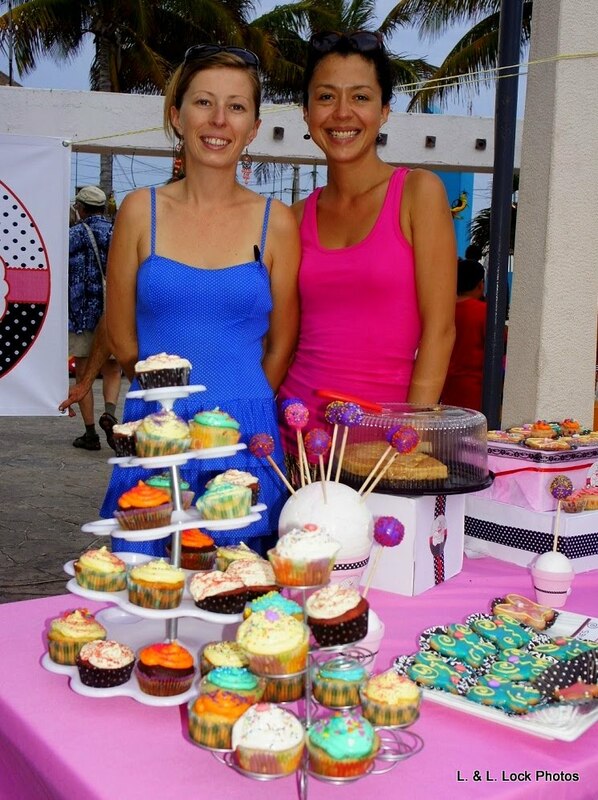 With a name like Sugar and Spice Bakery – we just had to stop at their booth during the Artist Fair in the Square on Isla Mujeres. Yum! Katie Abbott and Yazmin Aguirre Rivera had stacks of cupcakes in every colour, flavour, and style. I really wanted one of each variety; but taking photographs while eating icing-slathered cupcakes was a recipe for disaster. Although photos shot through a smeared camera lens might have created an interesting effect; an ethereal soft-focus with a finger-licking-good taste. This colourful affair is the brainchild of Tiffany Yenawine Wareing and Brad Wareing. It started modestly a couple of years ago, setup outside the Barlito’s Bakery on Hidalgo Avenue. During the high season Tiffany invited a variety of local and visiting artists to sell their jewelry creations, or paintings, or photographs on the first Thursday of every month. Eventually the municipality told Tiffany that she needed a permit for the successful art show. She replied: “No problem. What do we do to get a permit? And by the way, why don’t you give us a hand with this? 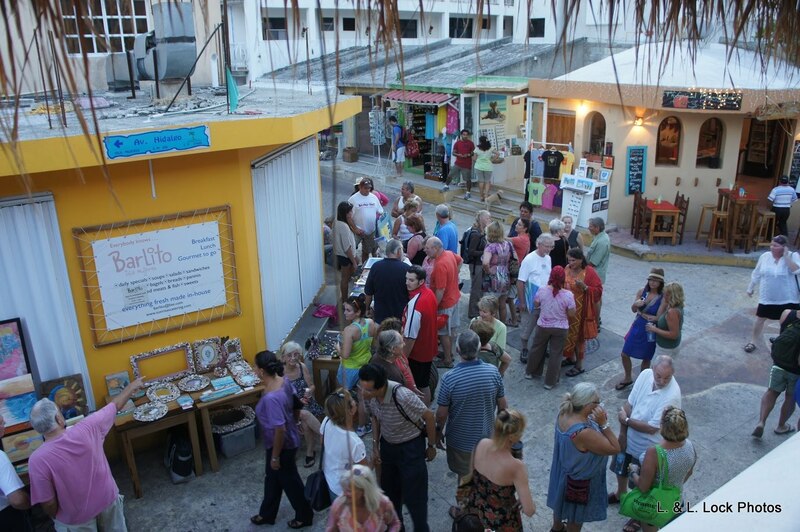 We’ll make it bigger and better.” After a few meetings, negotiating back and forth, the municipality joined Barlito’s Bakery as a sponsor, along with Fayne’s Bar, and Soul de Isla. The improved event has been relocated to the square in centro. As we roamed around the fair greeting various island friends we recognized familiar faces. 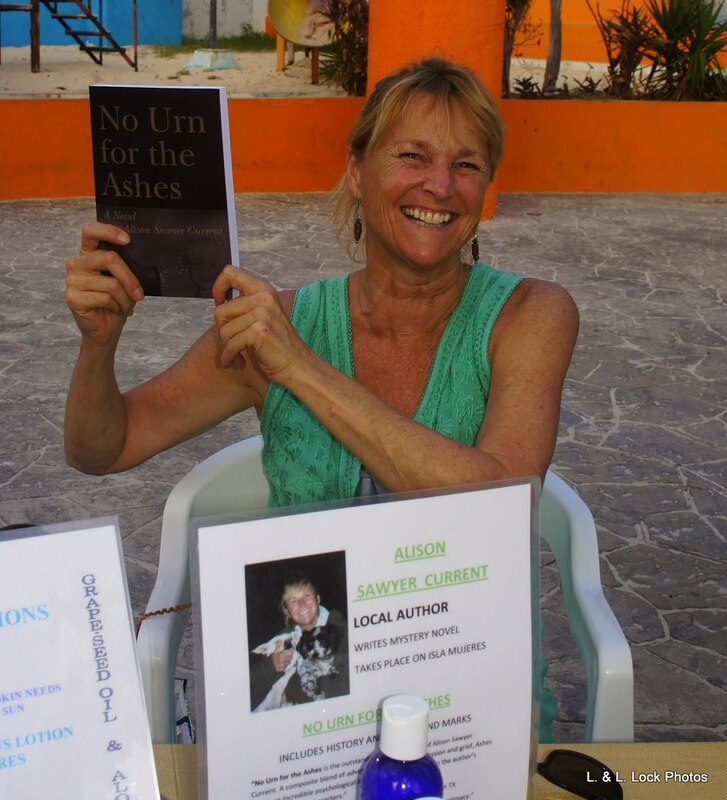 Always smiling, Alison Sawyer Current was there selling her books in support of the Isla Animals Society. Alison is better known as The Dog Lady, as she works tirelessly to improve the general health and well-being of local and mainland pooches. Alison is a multi-talented artist. 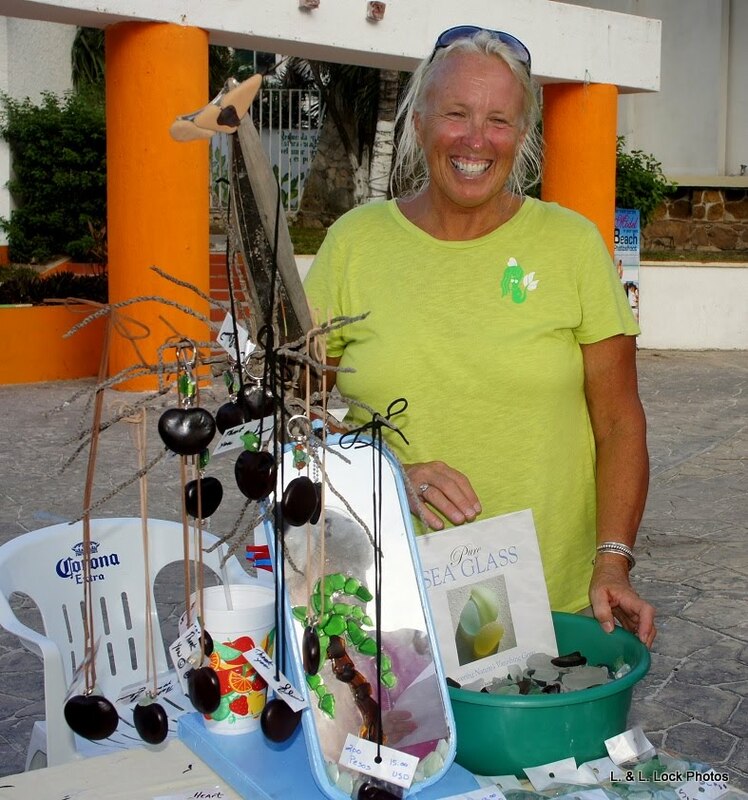 Besides organizing spay and neuter clinics, and rabies inoculations, she writes books and makes beautiful pottery. When I think of Alison, I think of an old quote by Lucille Ball: “If you want something done, ask a busy person to do it. The more things you do the more you can do.” That is Alison! In other areas of the fair, we enjoyed seeing the other artists’ handiwork. 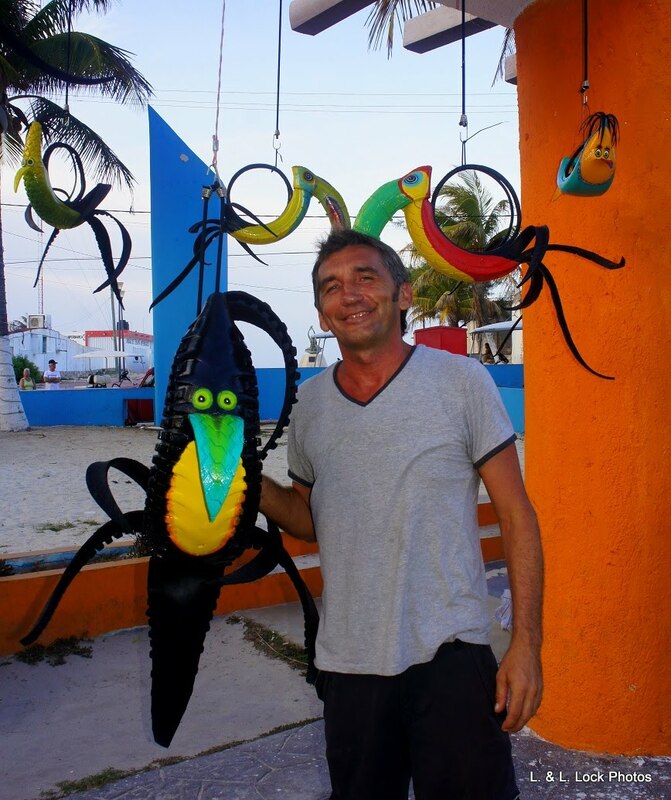 Damien Lemée from Montreal Canada dangled his quirky tropical birds created from recycled vehicle tires. A few of our friends have his whimsical creations hanging in their homes, and on patios. 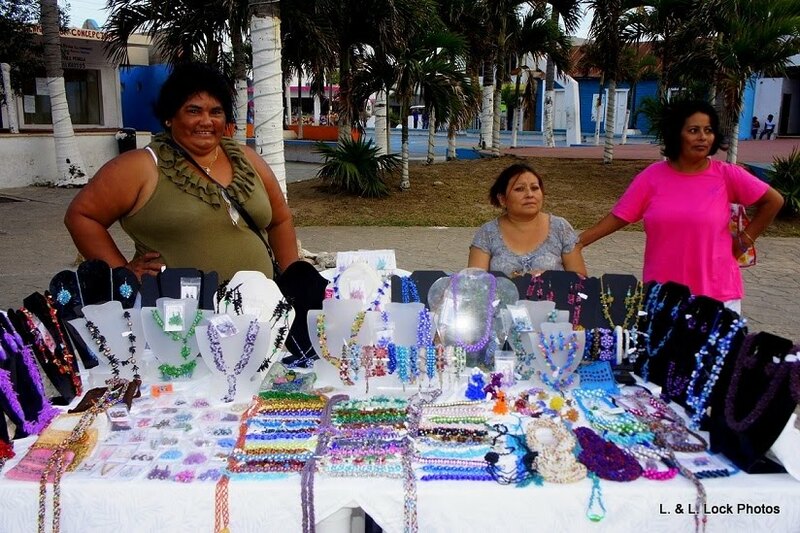 Across the square from Damien, the Isla Women’s Beading Co-operative had a great selection of items for sale, all patiently made by hand. I can hardly see the tiny glass beads, never mind actually stringing them into intricate creations. 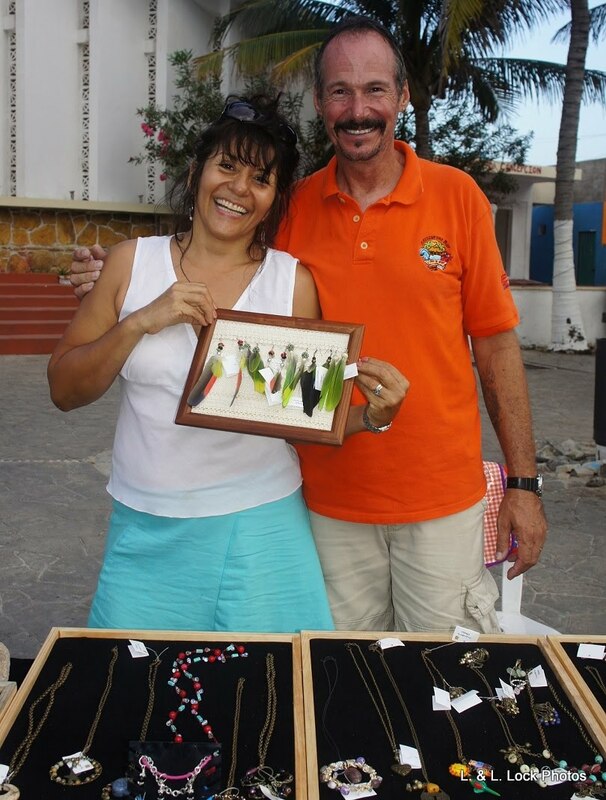 Nearby, Eileen Regn showcased her sea glass and sea heart jewelry collection, while Gladys Galdamez and Gunther Hepner had a variety of clothing and jewelry to sell including earrings made from colourful feathers. There were many more contributors – but Lawrie and I spent a bit too much time socializing. By the time I realized that I hadn’t seen everything the light had changed, making clear photos difficult. Ah well, there is always next month! Haven't been on Isla when the new venue has been in effect but went last year when it was at Barlito's–So many wonderful that I wouldn't have room in my suitcases for all I'd like to buy! I know what you mean! It's a great venue for the artists. I can see it getting even bigger with time. Next PostNext It must be ratings week!